We have changed the way we ask Xero about your account ledgers, tracking categories and contact information. Previously we were asking quite often and sometimes this has caused that the folder has disconnected from Xero. We have now optimised this behaviour. There is also a new feature that allows you refresh your Xero connection to re-load contact details and ledger account data. This is useful if you have added a new contact or new ledger account in Xero. 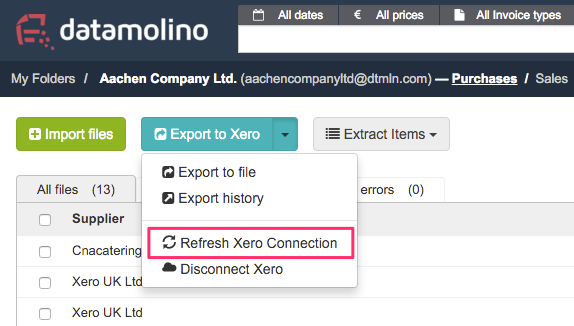 Just click "Refresh Xero connection" and you can start working with this new data in Datamolino. The file export to Excel and CSV now includes the name of the original file name. This helps people who use our file exports to integrate into their legacy systems. We have made various bug fixes to make the app more stable and the user experience smoother.